Invisible Hand at the Diamon Head finish of the Transpac 2017 race on Thursday, July 13, 2017. Photo courtesy of Sharon Green/Ultimate Sailing. 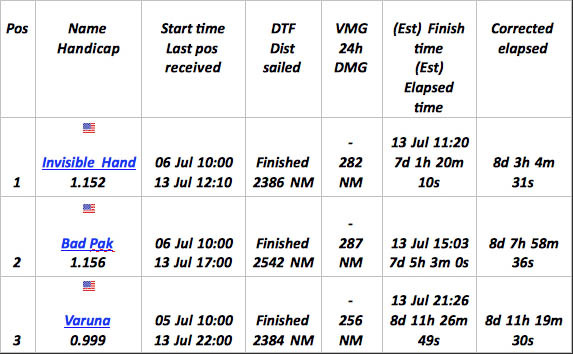 (Honolulu, HI), July 14, 2017 – Thursday (July 13) at 11:20:10 a.m. INVISIBLE HAND crossed the Diamond Head finish line to become the ORR Overall 1st place winner in Transpac 2017*, the fastest monohull to finish in corrected time, skippered by Frank Slootman in his Pac 52, and she was followed by the other new Pac 52, Tom Holthus’ Bad Pak finishing at 3:03 p.m. (1st-4th place overall finishers chart below). The Diamond Head buoy has welcomed the 1st place finishers of the 2017 biennial Transpac sailing race with the prestigous Kalakaua Cup going to INVISIBLE HAND this year, after a 2,225-mile trek across the Pacific Ocean from Pt. Fermin in Long Beach, California to Oahu. All four class winners include: Multi-hull, Mighty Merloe, who broke the record by more than a day; Comanche the stunning 100-footer won the power-assisted monohull divisioin in a new Transpac record; Rio 100, a new non-power assisted monohull wins for the 2nd time in a row, the coveted Barn Door Trophy (fastest monohull in elapsed time) in a new Transpac record. With more than 30 more boats to finish over the next few days, Hawaii sailors and affiliated boats are leading in some divisions. Last night and today they will hit the dock with many stories to tell and greeted by the famous The Hawaiian Aloha Welcome Parties at Transpac Island, Hawaii and Waikiki Yacht Clubs. There are many Hawaii affiliated boats and sailors this year,, including James McDowell and his yacht Grand Illusion from the Waikiki Yacht Club, the 2015 Transpac overall winner and a three-peat winner of this race; Pyewacket, skippered by Roy Pat Disney Jr., is also sailing under the Waikiki Yacht Club flag; Aszhou and her crew, including North Sails of Hawaii owner Fuzz Foster sailing with his son Fizz, all of which are locals from the islands; and Merlin, skippered by noted sailor and yacht designer, builder, skipper Bill, has Maui-native Keahi Ho on crew and UH Sailor Mackenzie Cook. For more information on how to get involved, attend the functions surrounding the race and/or to track the race live (four-hour delay), visit the Transpac website at 2017.transpacyc.com. Contact PR Chair Janet M. Scheffer at 808-521-1160 for any inquiries.